While we are still waiting for media to release the latest results of top grossing BPO firms in the Philippines. We have created an excel sheet to compare the previous and recent BPO revenue reports. As we can see Accenture ranked 1st twice in a row while Convergys ranked 2nd. The highest climber in terms of position and revenue was 24/7 which climbed from number 18 to 4 and a revenue increase of Php5.33 billion. We won’t go on to details about the position since the most important thing to look at is the revenue. If we check on the revenue of Aegis it was down, from the looks of it this could be the reason why they sold the business to Teleperformance. We can also see that Stream was down in terms of revenue it was swallowed by Convergys this year. We will update the excel sheet above once new reports come in. Checking the company’s year on year revenue is important because it could be a deciding factor on the company’s direction. If performance bonus and yearly salary increase has been put off chances are the revenue target was missed. We tried searching for articles about Convergys and Teleperformance on news if both companies will be acquiring new businesses. What we found out is that back in 2010 Convergys explored a possible sale and Teleperformance could be one of the top bidders. You can check the link below for the said report about Convergys possible sale from Nearshoremamericas.com. Ano ba yan wala pa din yung Company namin. This is relevant if you show BPO/ITO companies that gives high compensation in terms of salaries and benefits. Thanks for your comment, we know some guys who work for Netsuite, Solarwinds and HP that can help in creating the list. Please stay in touch with our updates. I wonder why ADP (PHILIPPINES), INC. is still not in the list. Can you please check on it? Thanks! ADP is not a Call Center..We do not earn based on the number of calls and clients paying for those calls. According to our friends in ADP (Philippines), INC they are KPO (Knowledge Process Outsourcing) and not BPO this might be one of the reasons why the company is not in the list. Sir what about Reed Elsevier? asa ka andyan ang Transcom, ang pangit ng Transcom! duh! Thanks for the tip. We will surely create that list. Accenture still in number 1, not a surprise, after removing the benefits of the employees little by little every year. Accenture is one of the company with great benefits way back in 2007. Wala po talaga ang Teleperformance sa list? Convergys and Jp morgan have 5 yr retirement plan..
@7:49 AM and @9:49 It's in the draft since last week, aside from Convergys and JP Morgan we also have Thomson Reuters and Citibank on the list. We are just verifying how the company implements the retirement plan. If you have any information please send us an email at thecallcenterfocus@gmail.com all information provided will be treated confidentially unless otherwise stated. Together let's build a community for call center employees by call center employees. Convergys ended their 5 year retirement plan for new hires starting 2014. Existing employees hired before 2014 will still have the 5 year retirement plan. They now have a 10 year retirement plan. For the 5 year retirement plan, you will get 50% of your basic salary multiplied by the number of years. For the 10 year retirement plan, 100% x # of years. @1:44 Thanks for the info this finally cleared the confusion. Does this include earnings purely from the BPO field? Accenture has other businesses like Consulting and Technology. I actually find the benefits in Accenture better compared to other BPO companies, plus the wide range of jobs available due to the number of clients they have makes them a compelling employer. Can you please check NCO or EGS? Thanks! I wonder why CITI Grroup is still not in the list? Thanks! Any particular reason why? I have just submitted my application. jpmorgan chasa not on the list? 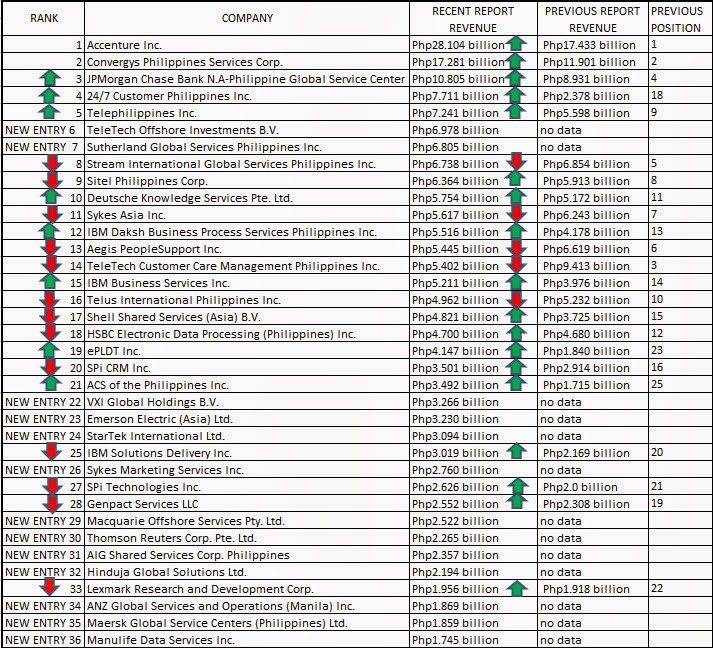 For those companies that are not on the list it looks like the centers revenue did not reach 1 billion peso mark. I doesn't look like it for me... Because JPMorgan Chase and West give good benefits and high salaries to employees, plus both companies have big financial accounts, which is more likely to pay more than other other accounts. So I can't see any reason why both companies are off the list. On top of that, as far as my information goes, West also has a 5 year retirement plan. hnd nakakapagtaka kung bket they are one of the top companies... lahat ng benefits tinanggal nyo na... next year anu pa kaya ang tatanggalin?????? Tata is Good also but they lay off programmers for JP Morgan only after 5 months working very bad. TELUS is one of the best BPO company, been here for 4 years, di ganun kalaki ang sweldo pero Future Friendly tlga, you can study while working because of the TI University, halos lahat ng agent tenured. Could not ask for more. Can you check for eperformax in the list? From previous report ePerformax Contact Centers Corp., P1.367 billion they did not make it to 1Billion for recent report. Mag lay off din ba eperformax? Or magbigay sila ng retirement. So Lourdes, would this mean that eperformax is a good company or not? A friend told me that eperformax doesn't have retirement plan and their basic pay is still at 14k. @11:30PM Salary and yearly increase are the things that you need to consider. We can't say if eperformax is good or not because we don't have a first hand experience on how it feels like to work there. If you are just starting to work in the BPO Industry 14k is not bad however 14k was being offered to starters since 2006. Glad my company is not on the list.. No need to Post ITO & KPO just keep the list or else it will be saturated nanaman. magiging Quantity over Quality nanaman. Thanks for the feedback, yes we will keep the list as it is. If someone is looking for a reputable BPO business, they should consider Core BPO. They have services starting at just $1.99. I use them for my business, and I couldn't be happier. I was very hesitant at first to use them, since they are so much cheaper than any of their competition. The age old adage, you get what you pay for, comes to mind. However, they are extremely professional and high quality. Unlike some foreign competitors, they screen all their applicants to ensure they sound like a native English speaker. I highly recommend them!